All-Clad B1 vs HA1: What’s The Difference? While All-Clad is primarily known for its high-quality multi-ply stainless steel cookware, it makes a variety of other styles as well. Both the HA1 and B1 cookware lines are made of hard anodized aluminum and feature modern, scratch-resistant non-stick cooking surfaces. These pots and pans make both cooking and cleanup a breeze with their great heat conduction and effective non-stick surfaces. But what’s the difference? 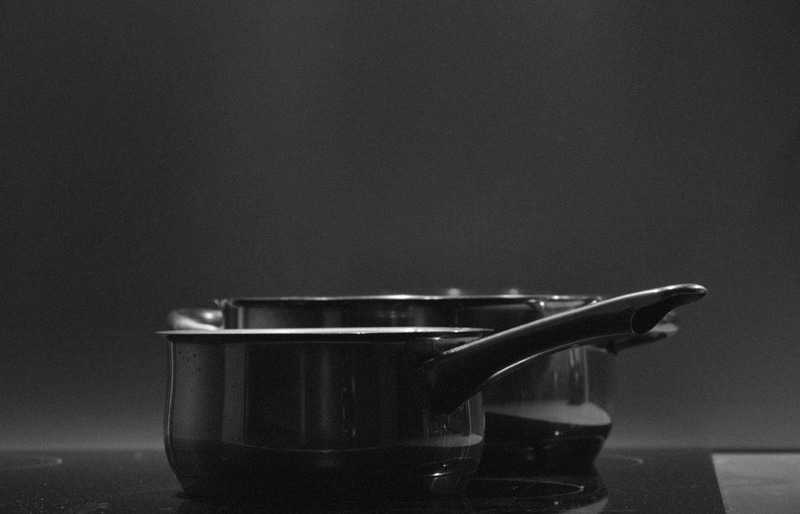 Let’s examine both HA1 and B1 cookware in order to learn about what separates these two cookware lines. 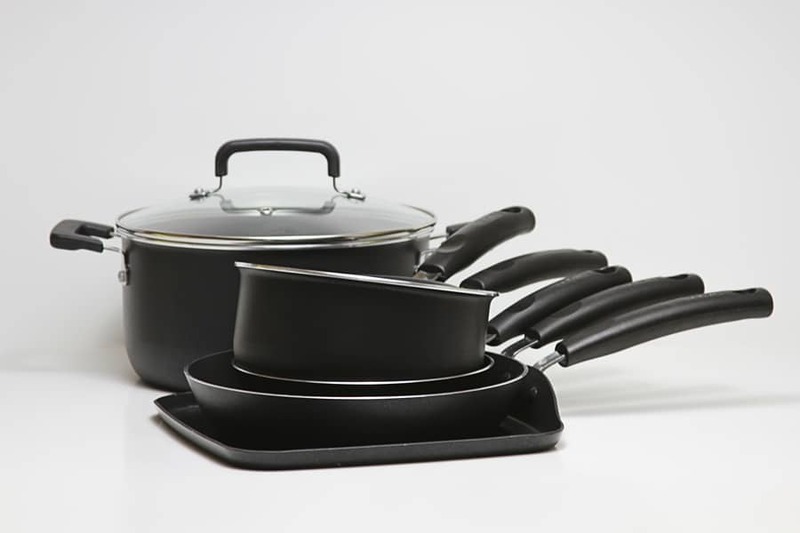 The HA1 line consists of fairly straight-sided pots and pans made of hard anodized aluminum. This material is both inexpensive and light, but most importantly, it has excellent heat conduction. This means that any changes in burner temperature will quickly make it to your food. The non-stick surface is made from a PFOA-free PTFE. All-Clad claims it’s scratch resistant, but in practice, you’ll still have to baby it a little in >>order to keep it safe. HA1 cookware comes with glass lids and metal handles. The handles aren’t the most comfortable things in the world, but in practice, this isn’t a big deal. 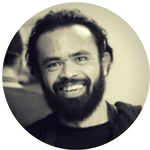 You’re not going to be holding your pots and pans for long periods of time. The glass lids are a nice touch as far as usability is concerned since you get to look at your food while it cooks. One of the things that separates the All-Clad non-stick cookware pieces from non-stick pieces from other brands is oven safety. While many non-stick pans can’t be heated above 350 F or so, this All-Clad set is oven safe to 500 F. This is partially due to the oven-safe metal handle, but the particular type of non-stick also has a lot to do with this. All-Clad has chosen a non-stick coating that’s particularly well suited to high-temperature cooking. HA1 is available as both individual pieces and as a 10 and 13 piece set. Personally, I’m more inclined to pick up one of All-Clad’s stainless steel sets and get a non-stick frying pan or two for eggs. If you think you’d prefer to have a fully non-stick set of cookware, however, this is one of the nicer ones you can find. So what’s the difference between the HA1 set and the B1 set? Not a lot, it turns out. Perhaps the biggest difference is that All-Clad’s B1 cookware is hard to find on Amazon. You can order it directly from their website, of course, but if you do that you’re not eligible for Amazon’s price matching, free Prime shipping or online sales. You can, however, find a few individual B1 pieces on Amazon. The differences between these and their HA1 counterparts lies mostly in shape. The HA1 frying pans have sides that straighten out very quickly, making it difficult to slide a pancake off onto a plate, for example. B1 frying pans have shallower sloped sides, enabling you to perform this task with ease. The handles also have some differences, but you’re unlikely to be affected by these. Why? The reason is simple: both cookware lines have handles that get somewhat hot. This means that you’ll frequently be using a potholder (or a kitchen towel) when you maneuver these pots and pans. The texture and thickness of your towel will have a bigger impact on how the pots and pans feel in your hand than the handles themselves. 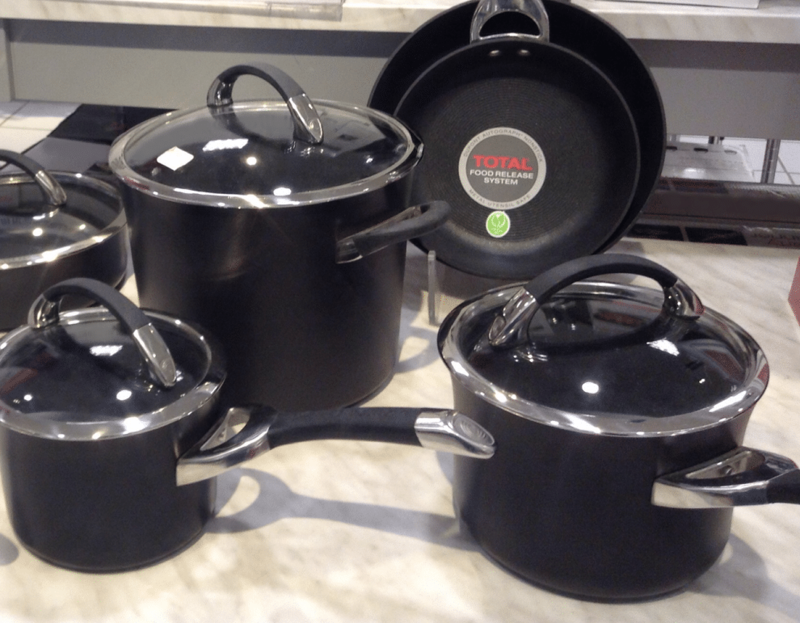 Like the HA1 line, B1 pots and pans are made of hard anodized aluminum and come with metal handles and glass lids. They use a similar PFOA-free PTFE which has a similarly high tolerance for high temperatures. Just like the HA1 set, the non-stick coating is somewhat delicate and will require careful use and care. At the end of the day, there aren’t any major differences between these two cookware sets that will affect how you use them in a big way. You’ll be able to make the same types of dishes with the same ease. Cleaning up both of these sets is similarly easy, and the non-stick coating has a pretty similar lifespan. Speaking of non-stick, if you haven’t read any of my other cookware reviews, you should understand that I think that non-stick cookware has a maximum lifespan of about 5 years. This number isn’t always 100% accurate (and you can certainly get LESS use out of your cookware by using high heat, metal utensils, or cleaning it improperly) but to the best of my knowledge every single non-stick cooking surface on the market (including ceramics) will stop being effective in well under a decade. This is somewhat awkward with All-Clad pots and pans in particular. Given the high cost of a single set (especially the Copper Clad line), it’s difficult for some households to justify the cost of a full HA1 or B1 set. For me, the solution for this is simple: just pick up a pair of frying pans instead. As much as I like non-stick, I certainly don’t need to boil pasta or cook rice in a pan with a Teflon bottom. Stainless steel will work fine for pretty much everything other than cooking eggs, pancakes, and a couple other of pan-centric dishes. This means that for me, supplementing a stainless steel set (like All-Clad’s MC2) with a pair of frying pans will cover all of my bases. I get incredibly durable cookware that I don’t have to replace that I can use for almost all of my cooking. For the rest, I just pick up a new egg pan every couple of years. All-Clad sells a set of two HA1 frying pans that are especially good for this purpose. Not only are they fairly affordable, you also get two pans. I like to simply keep one of my pans in storage until the coating on the first one starts to fail. This effectively halves the rate at which I need to buy new egg pans. You save a bit of money when you buy two like this, also, making this an especially cost-effective decision. It’s tough to figure out if All-Clad is worth it, especially with a non-stick set. Personally, I think the best option is to pick up one of their premium multi-clad lines and get a set of non-stick pans on the side for cooking eggs and other tough dishes. If you’d prefer a totally non-stick set, however, both the HA1 and B1 lines are excellent choices. They’re very high-quality non-stick pots and pans that will serve you well in your kitchen.